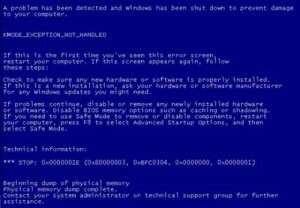 The KMODE_EXCEPTION_NOT_HANDLED error is an annoying Windows 8 BSOD that occurs for a number of reasons. Usually it starts happening after an upgrade from Windows 7, but even simple things, like trying to take a screenshot, can trigger KMODE_EXCEPTION_NOT_HANDLED, stop error code 0x0000001E. In this article, we’ll help you troubleshoot this error and fix it. The first thing you should do when you get the KMODE_EXCEPTION_NOT_HANDLED error with the error code 0x0000001E is to run a bug check. This is a known bug that Microsoft is aware of that is caused by drivers and sometimes software. If you have an OEM copy of Windows 8 that was preinstalled on your new computer, then your warranty should cover it and you should contact your PC’s manufacturer. And if you purchased your copy of Windows 8 separately, you can call Microsoft for assistance. 1. Use Windows Update to download and update all your device drivers. You can also open the Device Manager, click on View and select Show Hidden Devices to check if there are any yellow exclamation marks. If there are, then these drivers are the cause of the KMODE_EXCEPTION_NOT_HANDLED error. 2. Run Chkdsk to eliminate hard drive errors. To do that, run cmd.exe using the Run box, make sure you right-click on it and select Run as Administrator, type chkdsk /F /R and press Enter. 3. Run System File Checker to verify Windows files. To do that, open the Command Line (cmd.exe) as Administrator and type sfc /scannow. Then press Enter and let the scan run. Another thing you should do to fix the KMODE_EXCEPTION_NOT_HANDLED Blue Screen of Death is to repair your Windows registry. Because the registry is the central database of Windows OS, any errors within it can cause your computer to crash. Doing this should fix the KMODE_EXCEPTION_NOT_HANDLED error.